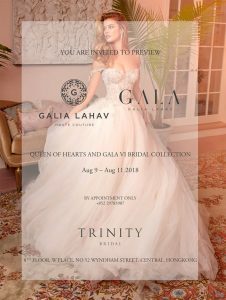 Trinity Bridal will be having a Galia Lahav trunk show this August 9 - 11, 2018. Get an exclusive preview of these gorgeous wedding gowns now! Email [email protected] or call +852 2978 3987 to book your appointment. 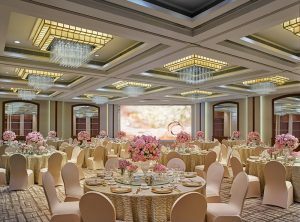 The moment all the brides-to-be have been waiting for is here! 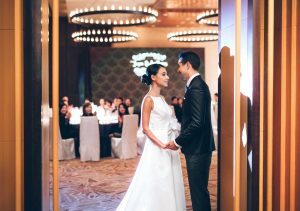 Find your dream wedding gown at up to 80% of at the Rania Hatoum Bridal's SAMPLE SALE happening from December 7-9, 11:00a.m. to 8:00p.m. in Central, Hong Kong. Bookings are now open, Kindly secure an appointment schedule to reserve a 30-minute fitting room slot. Walk-ins are welcome. For more information and details, or to reserve a fitting slot now, call or Whatsapp +852 5182 1983. Are you ready to say yes for less at Trinity Bridal? 3 DAYS ONLY! 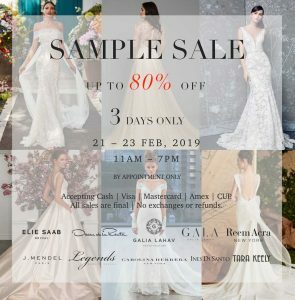 Up to 80% off top designer gowns including Oscar Dela Renta, Galia Lahav, Carolina Herrera, Reem Acra, Elie Saab and many more. Email and call them at [email protected], +852 2978 3987 to secure your appointment now before it’s fully booked!